Enjoy dessert for breakfast with this healthy strawberry cheesecake breakfast bake! It’s loaded with the delicious sweet and tangy flavour of a cheesecake, while having the awesome nutritional value of a bowl of oats. And it’s super easy to make gluten-free and vegan, so anyone can enjoy! In an individual sized (~16oz./500 ml) ramekin, combine the oats, oat bran, flour, baking powder, and salt. Set aside. In a small bowl or cup, combine the almond milk, cream cheese, sweetener, and vanilla, mixing until well combined. If you're having problems with your cream cheese incorporating, nuke it in the microwave for a few seconds so that it becomes more "melty." Add the wet ingredients to the dry ingredients, mixing until fully incorporated. Fold in the diced strawberries and sprinkle the graham cracker crumbs on top, if using. Bake for 20 minutes, until the centre has set and the bake has reached your desired consistency. Remove from the oven, add your favourite toppings, and enjoy! * If you don't have oat bran, use an additional 2 tbsp (10 g) of rolled oats. ** I usually use an all-purpose or whole wheat flour, but this recipe works fine with most flours, including gluten-free and grain-free ones. *** If you want to make this vegan, use a dairy-free cream cheese alternative. 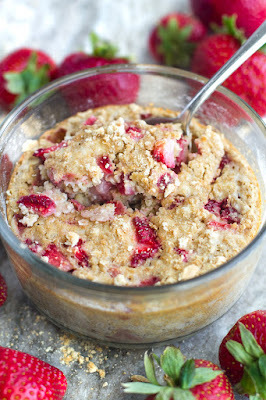 0 Response to "strawberry cheesecake breakfast bake"